Gaining the edge in today’s competitive market requires intelligence derived from data and the ability to act upon information to improve processes and machine performance. If you run equipment well past its useful lifetime, how do you measure the true effectiveness of that equipment? While some might say “well it’s paid for and it gets the job done,” that may not be enough to continue to operate the equipment unless you’re putting measures in place to realize the true effectiveness of the equipment. If you truly want an objective measure of the effectiveness of a machine, measures have to be put in place, especially with older machines. How often is the machine down for maintenance or repairs or unplanned downtimes? How much production time is being lost due to lack of machine capacity? What is the cost of the lost revenue due to lost productivity? How much does it actually cost to keep the machine running? How well is the machine performing against expected processing times; after all, there must exist a benchmark time from the original job quote right? While the older equipment still runs, perhaps it no longer runs as fast as it used to, and there’s degradation in performance and lost profits due to the job taking longer than expected. What about the quality of the parts? Is the quality of the parts up to today’s quality standards? If your competitor can deliver better looking parts, less expensively and with a faster delivery, this becomes the risk to your business and also the potential loss of a customer. The way to avert this is to establish measures or “proactive triggers.” Basically, objective decision-making based on facts, thus eliminating subjective analysis. Regardless the age of the machine, these measures can be accomplished either by manual analysis or by smart manufacturing applications. These measures are called OEE or Overall Equipment Effectiveness. OEE provides the metric for managers to see the true performance of their machines and where there are areas for improvement. While job tracking software provides information on jobs as they move from one machine to the next, the finite data on the performance of the machine requires information from each machine and analyzed by performance metrics such as OEE Calculations. Within the OEE analysis, is the metric of machine “Availability.” Availability is calculated by (Run Time/Planned Production Time). Run Time is planned production time minus stop times, where the production was stopped due to unplanned down time or other process stops initiated by the operator. Another metric of OEE is machine “Performance.” Performance is calculated by ((Total Part Count/Total Run time)/Ideal Run Rate) Ideal run rate is the quickest time a single part can be run. Performance takes into account anything that causes the manufacturing process to operate at less than the maximum possible speed. The last metric of the OEE calculation is “Quality”. Quality is calculated (Good Parts/Total Parts). The OEE calculation effectively takes into account all losses resulting in an accurate picture of your production manufacturing time: OEE = Availability x Performance x Quality. 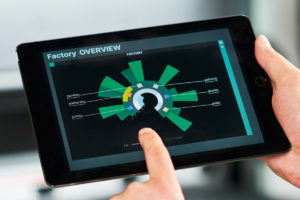 Modern smart manufacturing software like Bystronic’s ByCockpit application enables users to visualize the OEE metric and see in detail the Availability, Performance and Quality measurements that drive continuous improvement efforts in the manufacturing process and deliver objective measurements, as to the true effectiveness of their equipment.